CAMPAIGNERS FOR THE ‘No’ vote in the upcoming marriage referendum have accused the ‘Yes’ side of pulling down their posters. 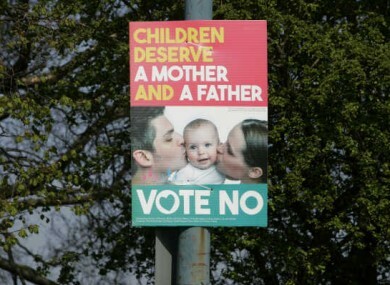 The ‘Mother and Fathers Matter’ group has said that it intends to report the removal of its ‘Vote No’ posters to the Garda this coming Monday – waiting to see if more incidents happen over the weekend. The group say that the action is being taken by campaigners for the ‘Yes’ vote and that they have seen evidence of this on Twitter and other social media sites. There is clearly a significant element of the ‘Yes’ side that either fears or opposes debate on this referendum. Instead, they are engaged in a campaign of harassment, intimidation, and criminality. The group pointed to an incident in which a Polish-Irish national campaigning for the ‘No’ side had abuse shouted at him while erecting ‘No’ posters. In a statement to TheJournal.ie, Brian Sheehan, a spokesperson for the ‘Yes Equality’ campaign said that individuals from his group had also been verbally abused while canvassing. “There have been isolated incidents against ‘Yes Equality’ groups including verbal abuse and threatening behaviour while canvassing. Such aggressive behaviour and personal attack is unacceptable on any person canvassing,” he said. It is an offence to take down any poster, we unreservedly condemn any such act. Members of the public who witness the removal of posters should report it to their local Garda station. “Our campaign is focused on what this referendum is about, civil marriage equality. Yes Equality wants to reach out to every citizen and to engage them in conversation about why the referendum is important. Open and honest dialogue is at the heart of what we do,” he went on. Email “The 'Yes' campaign responds to accusations of pulling down 'No' posters ”. Feedback on “The 'Yes' campaign responds to accusations of pulling down 'No' posters ”.